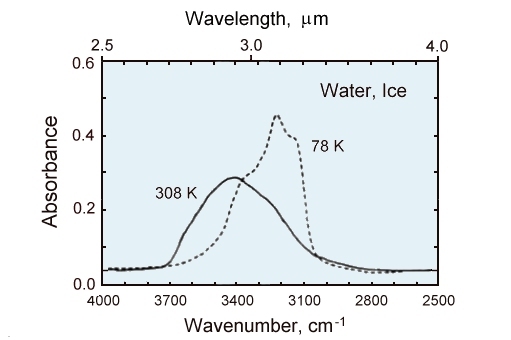 The study of water in minerals with in frared spectroscopy is reviewed with emphasis on natural and synthetic quartz. Water can be recognized in minerals as fluid in clusions and as isolated molecules and can be distinguished from hydroxide ion. The distinction between very small inclusions and agregates of structurally bound molecules is difficult. New studies of synthetic quartz using near-infrared spectroscopy are reported. These demonstrate that water molecules are the dominant hydrogen containing species in synthetic quartz but that this water is not in aggregates large enough to form ice when cooled. to the same thickness of ice at 78K (dashed line).